The architects are huddled in an intense meeting. Problems have arisen: the supports for the tower appear insufficient, causing balance issues. Should they proceed with the plans they’ve envisioned or make modifications for a less ambitious approach? The leader is unequivocal: the vision will be executed. His team shrugs, then proceeds in accordance with the original plans. There will be no compromise on the dream. Moments later, the tower of wooden blocks teeters, then comes crashing down on their heads. “I told you so,” yells one girl accusingly. But there’s no time for argument; they need to start over. They decide what went wrong and begin again, more carefully this time. It’s clear that the base needs to be broader and the blocks need to be stacked more carefully, with less airspace in between. It’s 9 am in the Woodpecker Room at the Harry Pregerson Day Care Center and these three year olds are hard at work. In the last five minutes, they’ve learned about gravity and balance, set a goal, collaborated, discussed expectations, learned from failure and demonstrated persistence. Throughout, their teacher asks them gentle questions, coaching them to analyze the situation and understand what might have gone wrong. Are they sure they need to build their structure on top of a wagon? If it didn’t have to roll across the room, wouldn’t that make the project easier? Or is motion important for their vision? Are everyone’s ideas being heard? I’m sitting in a corner, blown away by the amount of learning that’s going on here every minute. It’s been a long time since I’ve spent time with a group of toddlers, and I’ve forgotten how eagerly and relentlessly they learn. Every waking moment, these toddlers are negotiating with each other and with themselves as they come to find words for their emotions and learn to control their bodies. Preschool is on everyone’s minds these days as California contemplates a new bill that would add Pre-K to the public school system, something that, if fully implemented, would cost $200 million in the first year and possibly $1.46 billion over five years. Naysayers object to the cost and voice concerns about quality. Governor Brown has not expressed support for the bill. I hear the objections. And I think the naysayers are dead wrong. The fact that a good idea might not be implemented well is a preposterous reason not to try it; the argument could be made about absolutely anything, including school in general or, for that matter, democracy. Certainly that same argument could be made about standardized testing — which is currently being implemented disastrously, has shown few positive effects for over a decade, is not used by any other nations with successful educational systems and will cost us more in the next two years than this Pre-K measure might cost even at its most expensive. Studies have proven the benefits of preschool over and over, especially for children from low-income families, who by the time they are four, have experienced 30 million fewer words than more affluent children and are far more likely to have heard words of discouragement than praise. A major longitudinal study from the University of Chicago shows that children from low-income communities who attended preschool were four times as likely to graduate from college as their peers who did not attend preschool. They were also significantly healthier, less likely to start drinking before age 17 and less at risk for hypertension, stroke or diabetes. And yet California has slashed HeadStart more radically than any other state in the nation. 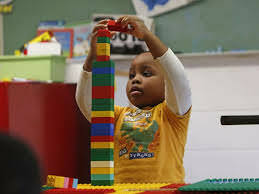 In 2011-12, we cut state preschool and child care programs by 15 percent. Recent statistics show that over 70 percent of California 3-to-5 year olds do not attend preschool for at least 10 hours a week. Having taught for years in a very low-income community, I was struck as I watched these three-year-olds by the overt learning of socio-emotional skills that some of my high school students had not mastered: self-control, confidence, persistence, empathy, planning, communication, self-awareness, behavior management and ability to trust a teacher. Children in preschool learn every day that the classroom can be a safe and caring place in which to take creative risks, fail, try again and grow. These skills are foundational; it’s absolutely useless to talk about holding students to high academic standards without them. More than anything, preschoolers learn the habit of finding language to match their experience. “Use your words,” the teacher urges them over and over, and they try, though it’s not always easy. But isn’t that the essence of what it means to be human? Isn’t that really what education is, a way of learning to name the world in all its dazzling complexity, and in doing so, to find our own place in it? Watching these three year olds learning so exuberantly, adjusting their understanding of the world every minute, I sit here and wonder—how in the world could we decide that all children should not have this kind of education at this critical point in their lives? Ellie Herman is a guest commentator. Read more of her thoughts at Gatsby in LA.